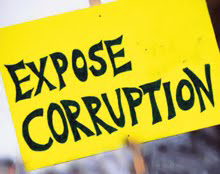 Aizawl, Apr 13 : As many as 12 officials were suspended and three others terminated following corruption cases in Mizoram since December 2008, an RTI document revealed. According to information obtained by anti-corruption watchdog Prism (People's Right to Information & Development Implementing Society of Mizoram) under the RTI Act, three MCS officers, two department directors and a joint director were among the 12 government officials suspended. Two officials, an MCS officer and a trade & commerce marketing officer, and a storekeeper under food, civil supplies & consumer affair department, were dismissed from services on corruption charges. During this period, 24 officials were charge-sheeted in connection with misappropriation of public money amounting to crores of rupees.